The Smiths are going strong in bowling! The big Smith bowler of America, of course, is Jimmy Smith, the peer of all alley artists, who hails from Milwaukee. Syracuse has another Smith in the making. Not a man bowler. Now a woman bowler. The Smith referred to is a 9-year-old girl, a Central New York blueblood product, whose home is in the village of Solvay. This kid of the alleys is little Martha Smith, the 9-year-old daughter of Mrs. Elinore Smith of 213 Lamont Avenue, Solvay. At the age of 9 years, this young lady has shown a genius on the bowling alleys, which is the talk of the town. Within the last month the kid has toppled over the pins at least 10 times, with a score of better than 175. While establishing a consisten record of 175 or over within the past month, this young lady has scored as high as 196. And only a 9-year-old kid! Young Martha posed for her picture at Doran’s alleys in Solvay like a veteran. Rolling a heavy ball for a good card is just as naturall for her as skipping rope on the sidewalk is to other girls her age. Martha hopes to be up in front with the ranking women bowlers in this part of the country someday. Eloise Jones, who won the Journal-American Central New York women’s tournament, had better look to her scoring records. The Doran boys, Bill and Francis, at whose alleys Martha has been bowling ever since she took uip the game, says that she can already beat many men bowlers. You will hear from Martha Smith as a bowling champion some day. At the present time Martha is in the “4-2” grade in the Prospect School of Solvay. Later Martha Smith moved from Solvay to Cato, a village about 20 miles to the northwest. Martha Smith, Cato farm girl who returned to bowling this year after after having been a child sensation on Solvay alleys a few years ago, today takes rank among the best women bowlers in America. The odds are she will win two of the six trophies posted by the Herald-Journal for outstanding feats by Syracuse and vicinity women in the Women’s International Bowling Congress. Miss Smith bowled into second place in the Congress ranking for singles bowlers with a score of 618. This not only tops all Syracuse efforts by 50 points, but leaves her second only to Sally Twyford of Chicago, making her one of three women to roll 600 or better in the singles. Pairing with Mrs. Fanny Anthony, Miss Smith took a firm hold on one of the Herald-Journal’s doubles trophies by scoring 1,117, not only the highest Syracuse total, but good enough to rank fourth in the International competition. Miss Smith hit 526 and Mrs. Anthony 581 in the doubles. Cato is very proud of Mrs. Martha Smith Brane who did so well in the national all-star bowling tournament in Chicago. Mrs. Brane was among the 16 finalists. She deserved the highest praise for her excellent bowling which earned her rank among the nation’s best women bowlers. 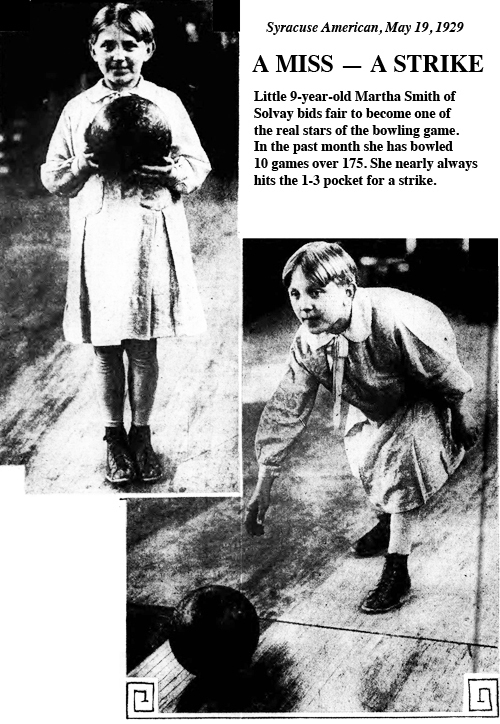 Martha began bowling when she was only a child in Solvay. Her instructor was Francis “Polly” Doran, former manager of the Solvay recreation alleys. Martha has a glittering rcord in tournament competition. She finished second in the Women’s International Bowling Congress tournament singles in 1939 and was sixth in the WIBC doubles the same year. In 1941 she won the WIBC singles and all-events titles and she also took the all-events crown in 1942. She won the championship in the Polish national singles tournament. Her highest three-game total was 668 and her top game a near perfect 290. Mrs. Brane’s showing in the Chicago meet is all the more remarkable because she dropped out of bowling competition for a few years during the war and has only recently returned to action. Martha and husband Kenneth Brane later moved to Florida. I found articles from 1963 in the Lakeland (Florida) Ledger and from 1970 in the Palm Beach Post, both reporting on Martha Brane's success in bowling tournaments. Apparently Martha's parents decided to take the name Smith because the family's real last name, Jerzgarzewski, presented too much of a challenge for Americans. Martha's brother, John Jerzgarzewski, died in 2008, and "Smith" was indicated as his nickname. The obituary listed Martha Brane of Florida as one of his survivors. Martha and Kenneth Brane had six children. One of them, Mary Brane, is well worth a Google search. She's a Florida artist who was badly injured in an automobile accident when she was 17. Not expected to live, Mary Brane was determined not only to survive, but completely recover. She hasn't made it all the way back yet and probably never will, but her progress has been nothing short of amazing.